An Outstanding Year in the History of Scuba Diving Equipment! Scuba diving had only existed in the USA for about 10 years prior to 1963, but by that time it was already taking America by storm. There were more scuba equipment companies than ever, along with various TV shows, dive periodicals, and magazine ads, enticing anyone interested into visiting the underwater world. Here are six of the largest scuba equipment manufacturers' catalogs from 1963! 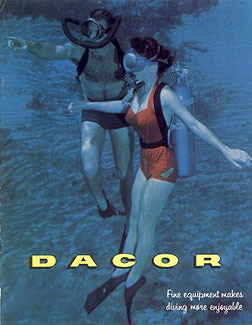 1963 Dacor - "Fine Equipment Makes Diving Enjoyable". Only three regulators were featured in this 1963 catalog: models R-4 "Dial-A-Breath" and C-2 "Clipper" two hose regulators, and the D-1 Dart single hose regulator. They retailed for $79.50, $59.50 and $59.50 respectively. 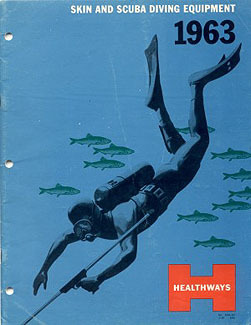 1963 Healthways "Skin and Scuba Diving Equipment". Healthways must have had a great year in 1963, as their catalog was a whopping 43 pages. They featured 4 different single hose regulators, and their double hose "Scuba" single stage regulator, which retailed for $52.95. Other equipment included spear guns, underwater lights, watches and depth gauges, rafts, air compressors, one of the first automatic decompression meters, and believe it or not, a 2-man submarine! 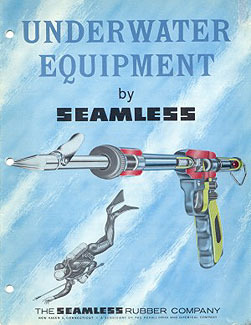 1963 Nemrod "Underwater Equipment by Seamless". The Seamless Rubber Company, out of New Haven, Connecticut, distributed Spanish built Nemrod regulators and accessories. They had a nice line-up of spear guns, including a very powerful "Pirate" pneumatic model. They only offered two regulators in 1963: the Snark III Deluxe two hose regulator for $69.95, and the Snark II Deluxe for $39.95. 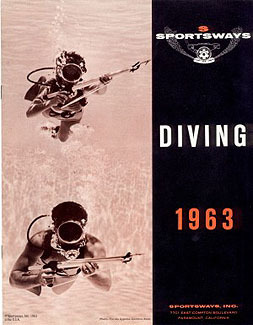 1963 Sportsways "Diving". Sportsways built some of the best regulators in the world at that time, and many diving records were broken using their single hose equipment. Their top of the line single hose was the Navy Unit II, and it sold for $95.00. Their double hose "Hydro-Twin" two stage regulator featured ports for a Sea-Vue pressure gauge, and a hookah attachment. It sold for $90.00, or $109.95 with the Sea-Vue gauge. 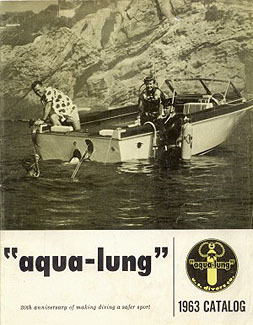 1963 US Divers "Aqua-Lung". This was the 20th anniversary of Captain Jacques-Yves Cousteau and Emile Gagnan's invention known as the "Aqua-Lung". The US Divers catalog featured 23 pages of a variety of gear, including the new "Calypso" 35mm underwater camera. 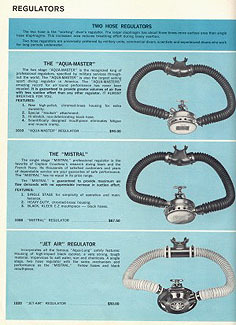 The three double hose regulators offered that year were: the DA "Aqua-Master", a top of the line two stage regulator that sold for $90.00, the single stage "Mistral", a favorite of Captain Cousteau's research diving team that sold for $67.50, and last, the ultra-modern "Jet-Air" single stage regulator, with a high-impact black cycolac housing and yellow hoses. Retail price was $50.00. Three single hose models were also available that year. 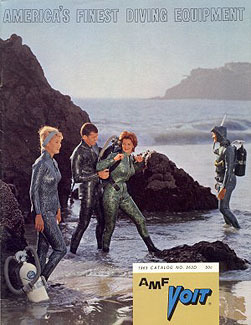 1963 AMF Voit "America's Finest Diving Equipment". Voit gained massive popularity from the Sea Hunt TV series because Mike Nelson used Voit gear almost exclusively. All Voit regulators were basically the same as US Divers models, with minor cosmetic changes. It was easy to distinguish a Voit two hose regulator from afar by its gray hoses and mouthpiece. 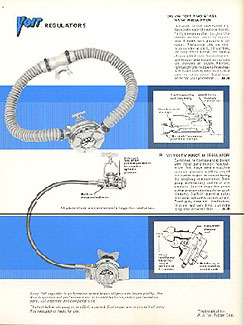 Only two double hose regulators were featured in 1963: the V66 Navy two stage, and the V22 Voit Polaris 50 single stage regulator. The Navy sold for $90.00 and the Polaris for $60.00. Three single hose regulators were also available, including the unbreakable and chip proof VR4 Voit Explorer II with blue cycolac casing.